First published Canberra Times 7 December 2011. 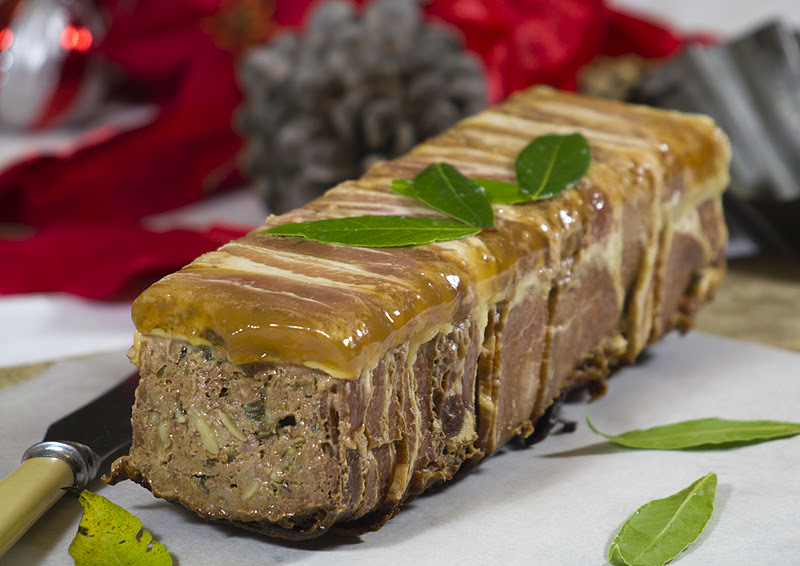 This terrine is another do ahead dish that is ideal to make for the hotter weather and perfect for a Christmas table. It is also a terrine that most people will eat as it does not contain any offal meats. I have added the Christmas spirit in the form of brandy, prunes and pistachios to the terrine, but you could add any type of nuts, fruit or spirit to get those festive flavours happening. Adding alcohol to the meat gives it some further longevity and will intensify the flavours the longer you keep it. When filling the terrine with the meat, make sure that it is packed down tightly by pressing it with a weight while it’s refrigerating. This allows the slices to be cut thinly without it crumbling when serving. If you don’t have a terrine mould, you can easily use a loaf tin. Preheat the oven to 180C. Lightly grease a 25 x 11 cm terrine or loaf pan. Line the terrine with the bacon so that it overlaps slightly and hangs over the sides. These lengths of bacon will then fold up over the top and cover the meat when it’s filled. Heat the oil in a frying pan, add the onion, garlic and nutmeg and cook for 2 to 3 minutes, or until the onion is soft. Add the prunes, pistachios and grainy mustard and cook for an extra minute. Cool, then mix with the mince, breadcrumbs, egg, brandy, thyme and parsley in a large bowl. Season with salt and pepper. Fry a small piece of the mixture to check the seasoning, and adjust if necessary. Spoon the mixture into the bacon-lined terrine, pressing down firmly to avoid any air bubbles. Fold the bacon over the top of the terrine, cover with lightly greased foil and place in a baking dish. Place enough boiling water in the baking dish to come halfway up the side of the terrine. Bake for 1 to 1¼ hours, or until the juices run clear when the terrine is pierced with a skewer. Remove the terrine from the water-filled baking dish and pour off the excess juices. Cover with foil, then put a piece of heavy cardboard or a cloth over the top and put weights or cans on top to compress the terrine. Refrigerate overnight, then cut into thin slices to serve. The terrine can be made ahead of time and stored in the refrigerator for up to 5 days.